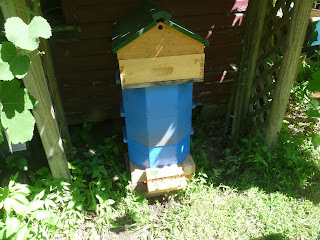 Swarm #1, which I put in the blue hive has now received its second additional box, as the first one is full. They are about halfway through the original in capped honey so I had placed a honey comb super on top and they are interested but am not sure yet if they are filling the mini boxes yet and I don't like to disturb them too much. I had suited up for this operation because it is in tight quarters under my grape vine arbor, but these bees are gentle and it wasn't necessary. It still surprises me that all my hives are so gentle, they don't even get upset when I accidentally hit the hive with the power mower.